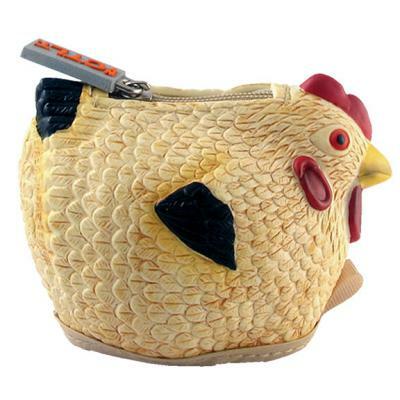 The Urban Chicken Consultant Recommends… the Rubber Chicken Purse! The rubber chicken purse makes a definite statement. I’m not quite sure what that statement is yet, but I’ve found that people remember the purse more than they remember me. Either that, or they leave lots of room on either side of me as I walk down the street. 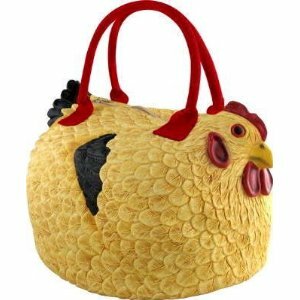 For an urban chicken consultant, this purse also functions as a marketing tool. Nothing gets a conversation going like a rubber chicken purse. Therefore it is a tax-deductible business expense (I’m hoping my accountant isn’t reading this…). Chicago residents can find this chicksessory at the Chicago Architecture Foundation and Hoypoloi Gallery (my FAVORITE Chicago art gallery). Those not lucky enough to have access to Hoypoloi Gallery (or Chicago) can purchase the purse online. For those who truly want to maximize accessorizing potential, try the rubber chicken change purse. Love the matching chicken change purse! Rubber chickens never go out of style! Yes, this is truly a timeless fashion accessory! My sister sent me this chicken purse because I started raising chickens this year. It is the best gift by far that I could have ever received. It is such a happy gift I carry it everywhere and get so many compliments and everyone wants to know where I got it. I have referred so many people to look for the rubber chicken purse. Wonderful gift. I am going to also purchase the change purse also. Yes, it’s a lot of fun! (-: I’m glad you’re enjoying it!